So it’s summertime around here, by most measures. The kids are out of school, and a lot of our daily schedules are changing. Normally, I’m driving my oldest boy to the gym on Mondays and Wednesdays for his team practice, which means I’m at the gym on these two nights as well, from about 5:30pm to 8:30pm. But we are in Championship season now, so the kids are training on Tuesdays and Thursdays instead, from 4:30pm until 8:30pm. A minor change, I know, but just enough to throw us all out of sync. 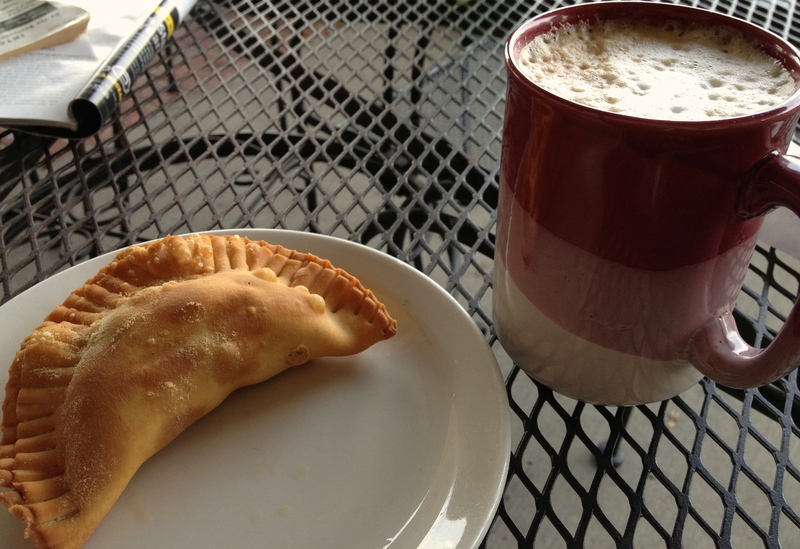 I could head over to the Cuban restaurant around the corner, get a cafe con leche and an empanada, and read my book. There’s lots that needs to be done, and trust me–we are doing it. And yes, when I got home tonight, I packed up a few more boxes (of books, what else?) and cleared off another bookshelf…. But at that particular moment, rather than rushing off on an errand, or trying to squeeze in a few more minutes of productivity out of the day, the best way I could think of to really be in the moment was to take a moment. Now that I think about it, maybe I should have titled today’s entry brake. This entry was posted in Uncategorized and tagged being present, monotasking, rest, simplicity. Bookmark the permalink. Oh I am so glad you took door no. 3!